A great source for meditation/reflection. Has the bonus of making me think about my recovery in the context of the man I would like to become. I love having this on my phone. I've always forgot my hardcopy and this has enabled to to keep it with me all to time so I can read and re-read the days meditation as needed. Fantastic having this favorite daily in my pocket all the time! I use it everyday. It gets me in the right state of mind before I start my day. Excellent App! Only complaint is you can't highlight passages for review later. Maybe in a future update? Otherwise it's great to not have to lug another book around. It took me a while to start "book ending" as part of my 12-Step Recovery. I read Touchstones and three other Hazelden books every day! If my day isn't going great, I read them again! They help to shift my thinking about life and people. I have used this book daily for the last 24 years and delight in the fact that each day I get to get more insight and support. The Iphone edition is so easy to use and lets not have to carry the book. Thanks! Irritating self-promoting splash screen. Just get to the thought of the day, already! Other than that, it works fine. Even though I have read the Touchstones in print for many years it is great to know that I have it with me on my ipad when needed. The most helpful and amazing tool for building and maintaining ones spirit. Having this app @ my fingertips gives me the chance to center myself and remain focused. A real blessing!!! An AA must-have. Best Daily Minder. Excellent. Well written briefs I find very helpful. One of my key tools in my AA toolkit. I have been reading Touchstones faithfully for my entire sobriety and still learn something new everyday. 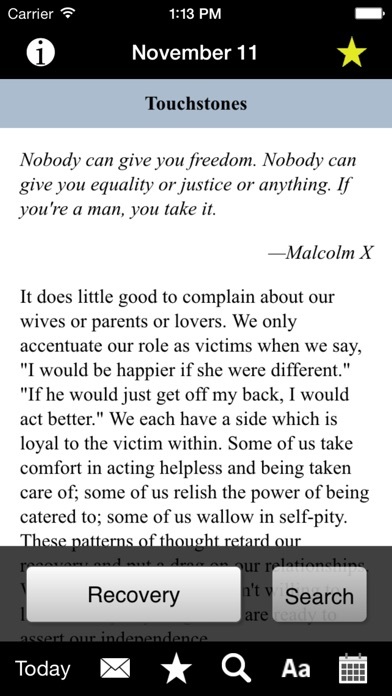 Somehow these daily meditations always seem to speak directly to me. They speak hope and reassurance constantly. Excellent recovery resource. Helps set the tone daily for my continued sobriety. A must have for me. Great app. Great insights to guide my spirit for the day and meditation. If choose another reading first in morning, always at some time during day open Touchstones to recenter. This book has helped me to become a better person on a daily basis. All you have to do is listen to its wise words from so many. I'm a captain on an offshore supply vessel and read a verse to my crew daily in hopes that it will make us all become better people and remind us not only where we've come from but more importantly, where we are going in life... Pay it forward and help someone else to see the potential that we all have as human beings in general for a better world and place to live amongst one another. Readings often contain something that I really need to hear that day. Great morning read. I have several guys who read and share from it everyday. Powerful, challenging and insightful. But... biggest annoyance is having to wait for the app to go through it's "Hazleton" plug screen and then the "Touchstones for Men" screen. Yes I know it's a Hazleton publication. 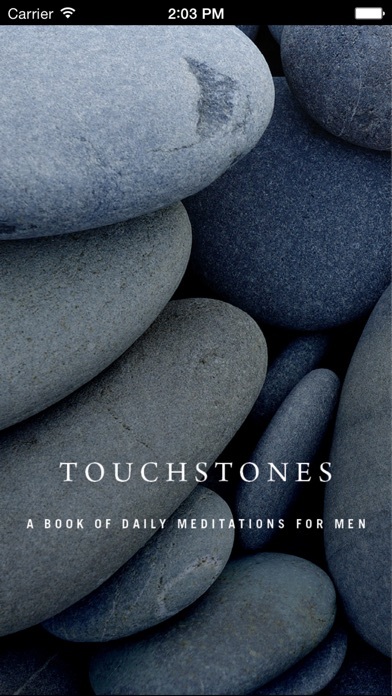 Yes I know it's Touchstones for Men... I clicked on the app! I reference back to the read up to 5-7 times every morning while working with others. It's annoying especially when all the other daily reads are capable staying "open" on that day's page for at least that day without having to "plug". Hazleton... please take a look at any King inc. app. They stay open for 24 hours or unless you close them. Is this petty? Maybe... but you've been asking for a rate and review for the past week. I like botg the quotes and the meditations. It all helps to keep me focused on what is important. I've had a hard copy for years. I love being able to email to others. Touchstones has been a daily part of my recovery from addiction. I love it! 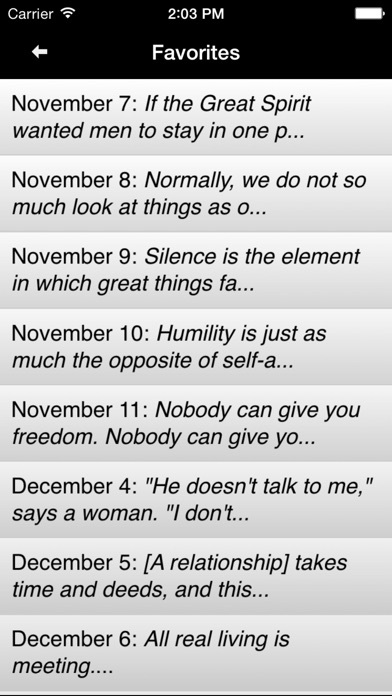 Each day this is my first in a series on daily reading and meditation. For a recovering person this is a great app. 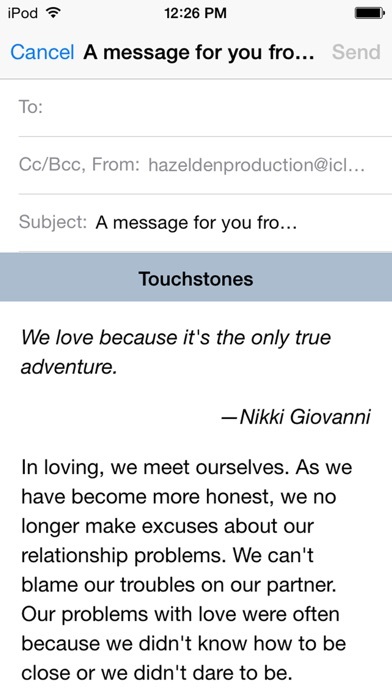 I start my day reading Touchstones! Great job. Always relevant insights. wordswithoutspacesmakenosense Words without spaces make no sense liveswithoutspacesmakenosense Lives without spaces make no sense I try not to hit the ground running anymore. Touchstones has been a part of my daily getting quiet for 20 plus years. I am a recovering alcoholic as well as food addict. And this is of course coincidence, but it seems on my weakest days this app sends me the exact Reading and meditation at just the right time that I require. Thank you. Everyday enrichment for the spirit!!! Love the app! Worn out my paperback copy since June of 2008 when I got sober. I buy the book for all my sponsees. It is a great daily reading for any man in recovery. No app provides me with more useful fuel in my daily life. I've had a print copy for many years and now like having a copy close by at all times. This is a very helpful edition. I've subscribed to several Hazelton's books and this is my favorite! 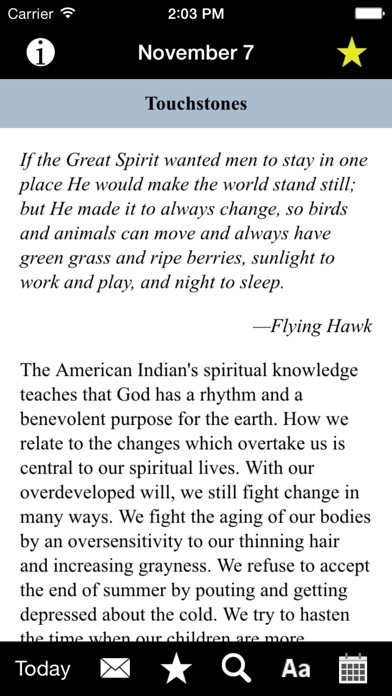 A daily dose to men what it means to grow along spiritual (not religious!) lines. Love the app but when I upgraded to iOS 10 the type shrunk to a size that is almost illegible and I have it on the highest type setting. PLEASE FIX MY FAVORITE APP. This is a great addition to my daily meditations. Well worth it! Great app, more convenient than the paper book, and always at my fingertips! Much more intelligent than the other daily books. This book really helped me in my recovery. I'm grateful to have discovered this daily guide for men - it would be helpful for any man open to a healthy, growing mindset.